Coat: Black with small arcs of yellow lightning flowing through it. 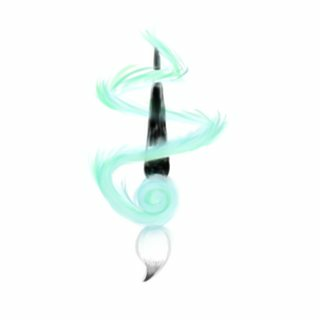 Mane/Tail: Long and wispy, glows in the dark. Supernatural Sense of Smell: Like others in his family, Hogosha posesses an incredibly acute sense of smell. Is capable of sniffing out anything and anyone provided he’s caught their scent once before… and the weather is good and his allergies aren’t acting up. Magic Condition: As a Yokai, Magic is an inherent part of his being. This often manifests as the glow and bolts of ethereal lightning that shoot across his fur, but also is shown through great shows of speed strength and healing. Storm Magic: Can conjure storm clouds at will and can even walk on them and use them for quick transportation. Can also temporarily turn his body into stormclouds for short periods of time. Windy Breath and Lung Capacity: Is able to hold his breath for long periods of time without need to inhale again. Can produce howling gales of wind by blowing or just by holwing. 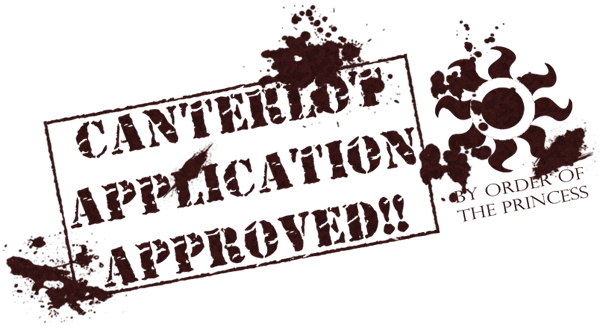 Spell Beads: Six Beads that hover around Hogo-sha’s neck. If he bites down on one it grants him a magical boon with different benefits and drawbacks. Wall Walking: A passive magical aura that lets Hogo-sha run and walk on almost any solid surface as if gravity had been altered. Sturdiness: Increases his endurance and lets him redirect potent forces away from himself. Stormcloud: Makes himself intangible for a short time and can turn himself into a stormcloud in the same shape and size of his default form. Lightning generation: enhances his electrical magics, can make his fur shocking to the touch, and can bark lightning strikes at a maximum of six times. Alter Sword: Can alter the properties of his weapon, typically leaving it as a Bokken in most situations. When needed he will turn it to normal (if incredibly sturdy) sword. Can only change and reshape his custom sword made by a family friend. Bigger and Badder: Sacrifice his storm and illusion magics to increase his size, strength and speed. Disliked using it as it locks him into the form for hours in exchange for the massive change. Only makes him larger than a carriage but smaller than a medium sized building. Shapeshifting: Capable of switching between his two forms easily in most circumstances. 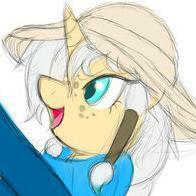 Currently, stays in a diamond dog guise most of the time but is working on a pony one. Well Read: Is a big bookworm. The dwelling he had back in the mountain was essentially a small library that took up most of the space. Has deep knowledge of both eastern and equestrian poetry and literature. Not to the same degree as a professional scholar, but still very informed. Musical knowledge: Has been taught how to play bass guitar by his twin brother, tends to listen to a lot of jazz or occasionall jazz fusion. Hogo-Sha Was born to litter in a forest in Neighpon to pair of proud parents and several siblings (one of whom was lost). His Mother was Nijurkuya, a former delinquent Yokai and skilled mage from the city who seemed to adore seeking out trouble. 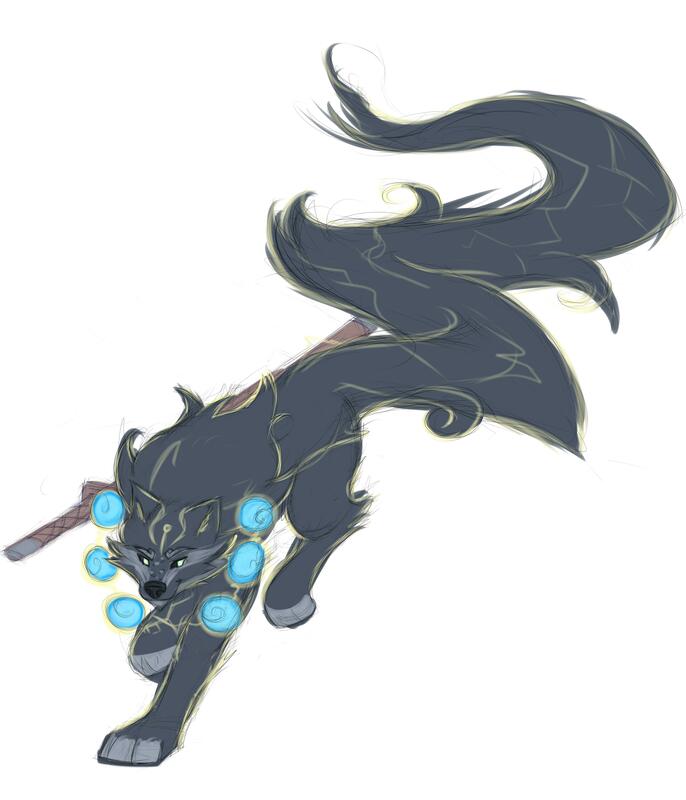 The pup’s father was a well known Okami of Legend who had been born before Neighpon had even been formed. Not long after he was born, Hogo-sha earned his name when he proved to be an oddly fussy and protective pup when it came to his family. Even when at his smallest he would nip and growl when an unfamiliar scent approached him or his family. At the age when his eyes were barely opened his bark proved worse than his bite. Like the rest of his siblings, Hogo-sha was raised on the mysterious Green Mist Mountains: A secluded Mountain peak in Northeastern Neighpon. Despite being the most competitive among his siblings he was also the most protective of them. When one of them came back home late he would continuously badger his parents to let him help scent them out. Even when they told him no he would still go out to search on his own. When he was out exploring the mountains one day, Hogo-sha went exploring by the river. Having seen his parents catch fish when they visited down here, he decided to attempt to catch some himself. He stepped further and further into the stream until he went too deep and was snatched up by the current. Lucky for the pup, one of his brothers was present and managed to save him from drowning. Since then he gained an intense fear of water… and thanks to growing closer to the sibling who saved him: a deep appreciation of music. Around his late teens, Hogo-sha began to travel outside with his mother and father on visits to the countryside and cities. On most of their visits, he would often spend long periods of time in libraries or bookstores. Mostly he would buy stories of folktales, mythology, history, samurai hoofbooks and… more than a few poetry collections. On the rides home, he would quietly read and absorb the information. One day he noticed that His Father was in a few of these, with many stories to his name. Stories of a disagreement with a trio of Katakirauwa, A great battle against an ancient Bear Yokai, Even leading a small army of yokai against caribou invaders in the not too distant past. These stories instilled in the young wolf the desire to forge stories of his own… hopefully not so many as silly as his fathers but more of the thrilling kind. He often would badger his father to tell him first paw accounts of the stories, asking him how those adventures ever got him excited. The answer was almost always something along the lines of making him exhausted just thinking about them. On one visit he caught a glimpse of an old newspaper he discovered that Taira had gone on a short rampage across the countryside near Polohama… back when he and his siblings were born. When he confronted him about this, the old wolf confessed that one of the pups had been captured by poachers not long after being born and had been taken to a Pony city. Taira tried to track down the pup but thanks to the skill of the poachers they managed to hide her scent and disappear into the urban jungle. Hogo-sha was shocked and disheartened. He promised not to share the story with his brothers and sisters, but the knowledge left him with a feeling of betrayal and broke the pedestal he put his father on. Once he was old enough he departed the mountain range and promised both his parents he’d only return occasionally until he’d made a legend for himself and became powerful enough to protect all the pack on his own. As an adult, he ended up traveling across the land and beyond in order to hone his skills in any way he could. He had focused so much on his other types of magic that his shapeshifting wasn’t yet as reliable. To make up for that skill deficiency he took on the form of a creature that wasn’t too different from his normal form: A diamond dog. 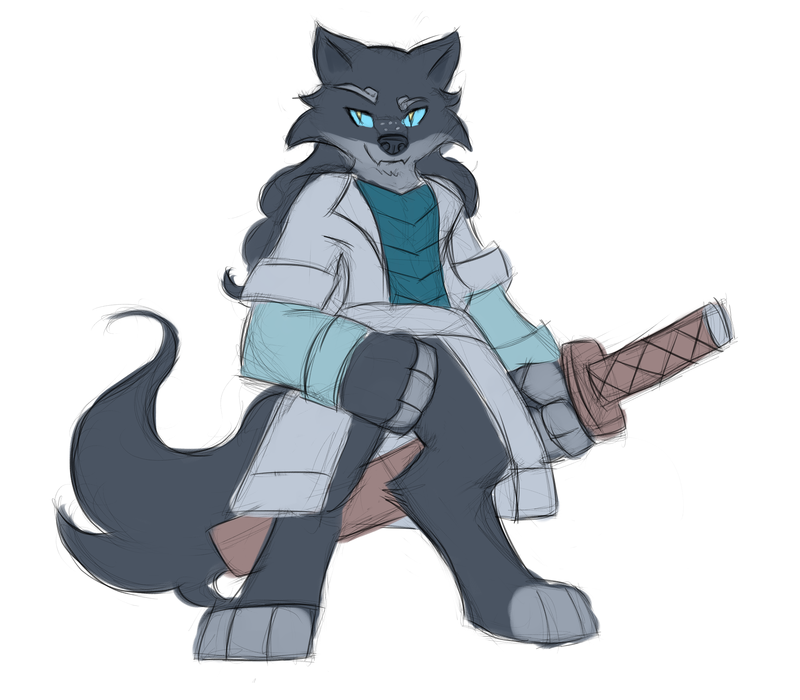 In this shape, he would travel across Neighpon challenging various dojos to test his skill and even finding a master to teach him other forms of martial arts and swordsmareship. In time he did manage to make a reputation for himself, a rumor of a diamond dog who would come into dojo’s across the east and battle various masters. He won many times and lost just as much, but still, he constantly strives to better himself through the conflicts. After a while, some even began seeking him out to teach them what he knew as he grew. Was Recently seen fighting in the Sarvaarberg Arena as a Diamond Dog. Hogo-sha is at his heart a well meaning but overly enthusiastic Yokai. Deeply concerned with protecting the things he loves, he often buries himself in absurd challenges and tasks to make himself stronger. In pursuit of this goal he has already managed to travel across the lands of Neighpon, Long Guo, and has recently began to test himself in the savage lands of Whitescar. Comparing Hogo-sha to your typical strong, silent warrior type may seem accurate at first. However, he often shows a more relaxed if occasionally awkward side to himself once befriended. While he prefers to keep things simple, he isn’t the type to turn down a chance at merriment or a good meal. He almost always carries a book with him on his person, typically it will be some sort of mystery fiction or romance novel he has found himself engrossed in. When he has some form of down he can be found visiting Jazz clubs or in the company of his brother when he runs into him. Hogo-sha may act brave in most situations, but he actually has a couple notable fears. His most prominent being a fear of deep waters. When traveling on boats, he has been known to stay in his cabin and refuse to come out until they meet the land. If in the presence of spiders he tends to do one of two things: Freeze up or panic. Sometimes he may one after the other! The more personal fear he has is letting others down. A somewhat dorky traveling swordswolf who wants to protect what matters to him and hopes to find more things that matter on the path he goes!